From a BBC docu series, this intense 75 minute study, lucently engineered by Signature Entertainment, illuminates one of the greatest crimes of the twentieth century with new perspectives where none seemed possible because everything has been said on the subject. We’ve heard it all, haven’t we? The holocaust of Nazi extirpation of its Jewish population during World War II has been analysed through seven decades, with the result that one feels indeed nothing new can be diagnosed in the most infamous inquest of the death of the human soul. But writer Ricki Gurwitz and director Matthew Shoychat prove such surety wrong with their relentless insight and thoughtfulness. The accountant of Auschwitz was Oskar Gröning. His duty was to separate arriving inmates from their valuables because they would no longer need them where they were going. Scrupulously, Oskar kept books on his daily inventory and provided evidence of his role as an accessory to mass murder. His crimes were a macro version of what George Soros admits he did as a Jewish teenager disguised as a Nazi youth in Poland. (The Soros interview is on YouTube.) Gröning’s crimes were no more or less heinous than the Gestapo butchers who changed uniforms and became judges and police in the reconstituted German government – or – the white Christian perpetrators of slave barbarity in the United States or its holier than thou Sovereign Nation genocide – something Hitler admired for its administrative efficiency. One can extend this roll call of dishonour to colonial exploits on four other continents; Stalin, Mao and Sharia for infidels; Buddhist treatment of the Muslims of Myanmar and on and on. Let’s not forget Rwanda, Cambodia and certainly not the Palestinians. Does every culture commit wholesale inhumanity? It seems so. The stock denials are too universal. Rationales run rampant through the bloodletting of history. The last living survivors of Auschwitz wanted some semblance of justice. Young legal minds in Germany wanted due form for a precedent and principle of law. Ivan Demjanjuk, Ivan the Terrible, had been arrested and tried in 1993 for helping kill 850,000 Jews. Taken from America where he had worked for the Ford Motor Company, his attorneys said he really didn’t build the whole car on the Fomoco assembly line, thus in the concentration camp, just as he performed only one duty, the whole policy of extermination was not his personal responsibility – the classic explanation, he was only one man ‘following orders’. But Gröning, when arrested and tried a decade and a half later, after Ivan, does not pretend medical incompetence and amnesia like Demjanjuk had. Oskar admits all and summarily refutes in that honesty the trash revisionism of holocaust deniers. He also says he is sorry; ‘I ask for forgiveness.’ One of the survivors testifying against him tells him she does forgive him. This infuriates her fellow accusers and boggles the heads of prosecutors as well. We get to see this for ourselves. It is an amazing moment in the film. No one brings up the infamous Yale-Milgram experiments either but they could have. If any interested student of human capacity for inhumanity watches this soul-breaking psychological experiment documented on YouTube, they will not glibly moralize on the ‘following orders’ defence ever again. Gröning is sentenced to four years in prison at age 93. Through appeals, he never spends a day inside a cell. The Accountant of Auschwitz is not an easy film but it is a necessary experience for everyone and anyone who thinks they have seen everything and heard everything on the subject. That is, if one is willing to escape the bracketed absolute truth of one’s consensual assumptions. Situational ethics thrive on slogans to comfort the humming hive. To seek a transcendent principle of neighbour relations in the family of humanity, to cite Martin Buber, is a proactive affirmation of ‘I/Thou’ with no mythic crutch of deity or political crutch either, what Santyana called the myth of the state. If, as Gröning’s accusers say, there is no statute of limitations on crimes against humanity, so be it. Then all democratic republics, dynastic empires, caliphates, peoples’ republics. commonwealths, federations, unions, tribes and cartels are guilty of crimes committed in the yesterday of history as well as in this morning’s news. Can our consensual truth stand present to this question? Will we ever learn from history so we don’t repeat it? So far there’s no evidence for that. Recidivism seems to rule our hearts and minds. 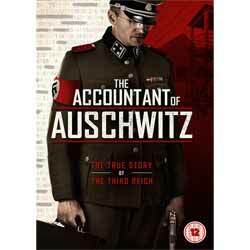 The Accountant of Auschwitz is a propulsive documentary, hard to watch but necessary to see.